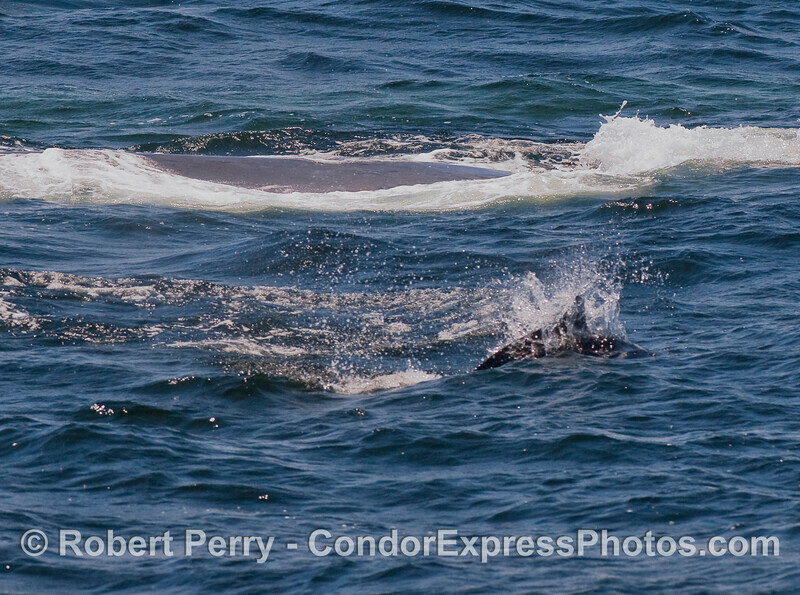 Blue Whales (Balaenoptera musculus), Fin Whales (Balaenoptera physalus), Humpback Whales (Megaptera novaeangliae), Common Dolphins (Delphinus capensis), and Dall's Porpoise (Phocoenoides dalli) on a windy day with bright sun off the northwest corner of Santa Rosa Island. Don't forget to click on the "Map This" button above and to the right. Thanks! 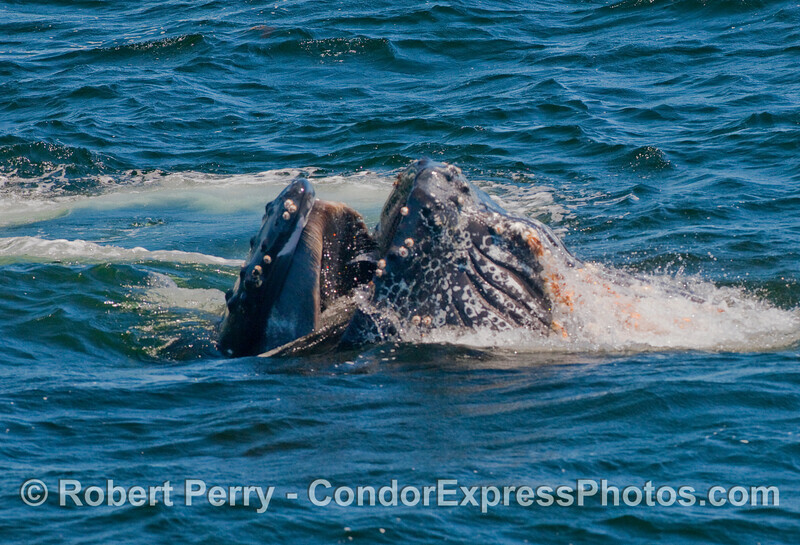 Image 1 of 2: Humpback Whale surface lunge feeding. 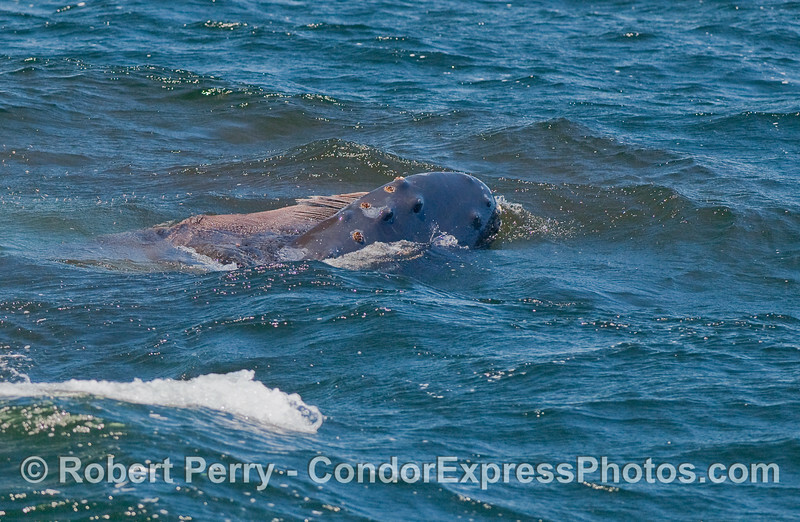 the upper jaw full of baleen is on the left, the lower jaw with greatly expanded gullar pouch is on the right. The little orange dots are krill (Thysanoessa spinifera). 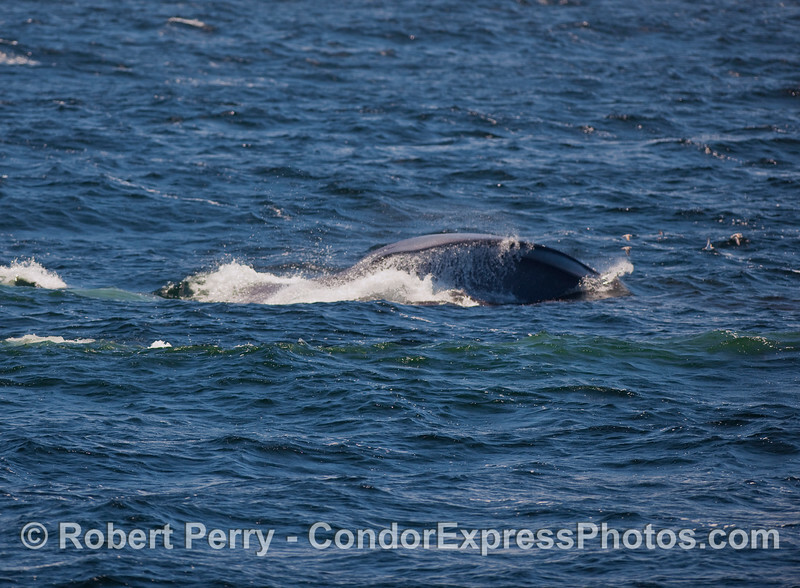 Image 2 of 2: Humpback Whale surface lunge feeding. 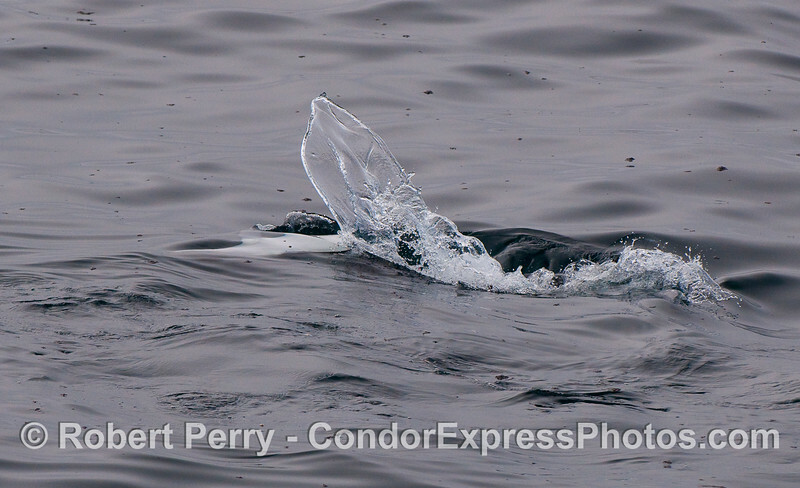 The mouth closes up, ejects water, and retains the krill as food. 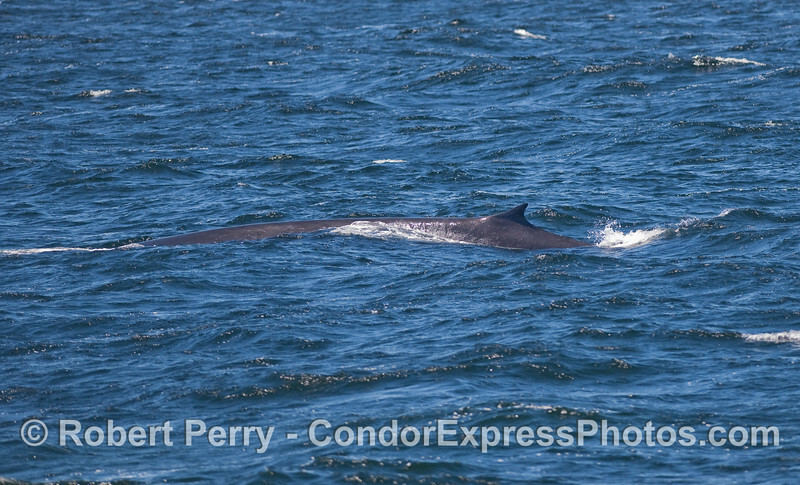 The second largest whale species on earth, and second largest animal to ever live on the planet - a Fin Whale. 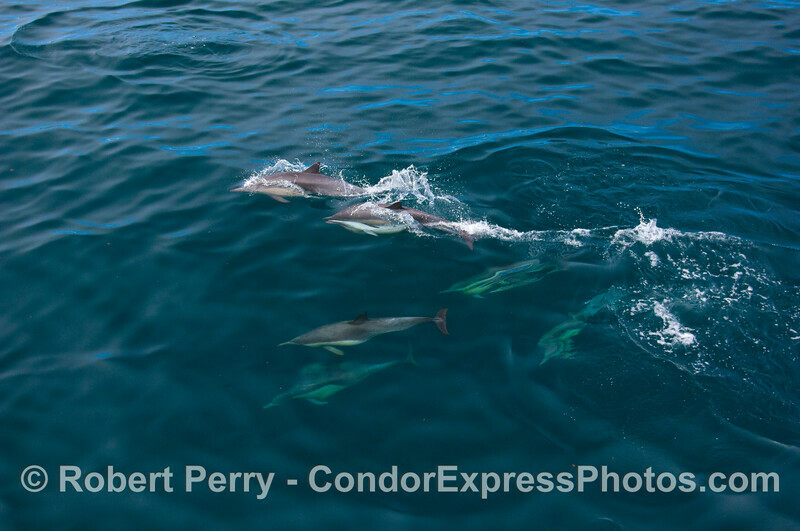 Common Dolphins, including one mating pair. Wide view. 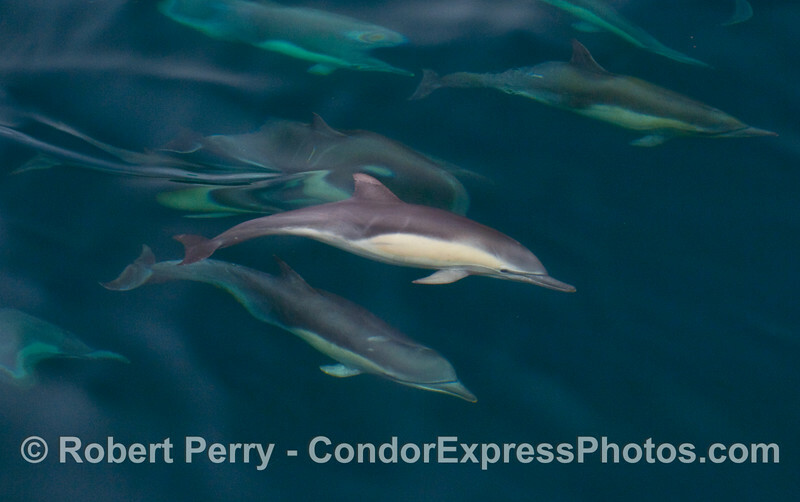 1 of 3: Common Dolphins, including one mating pair. Ultra wide view. 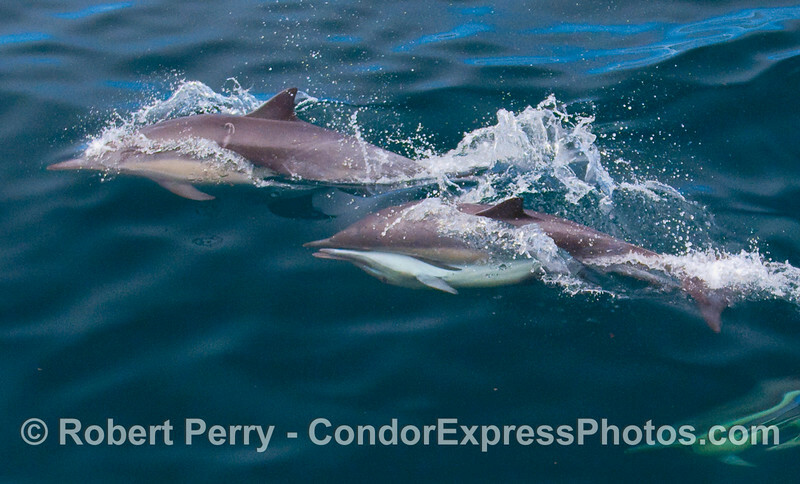 2 of 3: Common Dolphins, including one mating pair. Wide view. 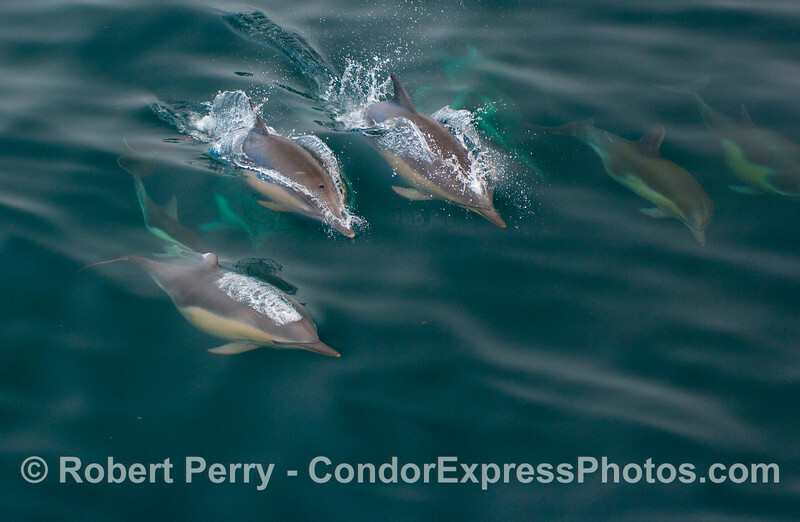 3 of 3: Common Dolphins, including one mating pair. Close up view. 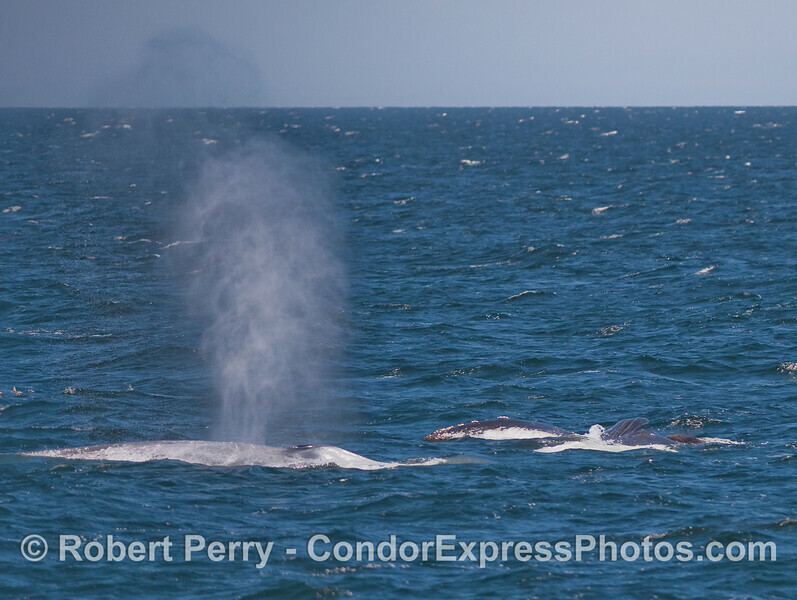 Two giant Blue Whales, one spouting, and one lunge feeding on the surface. 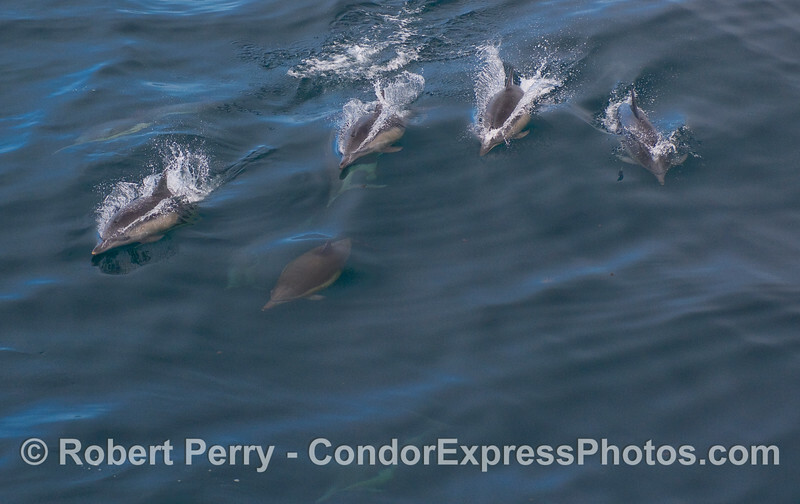 A Blue Whale spouts and sends a flock of Red-Necked Phalaropes (Phalaropus lobatus) flying. 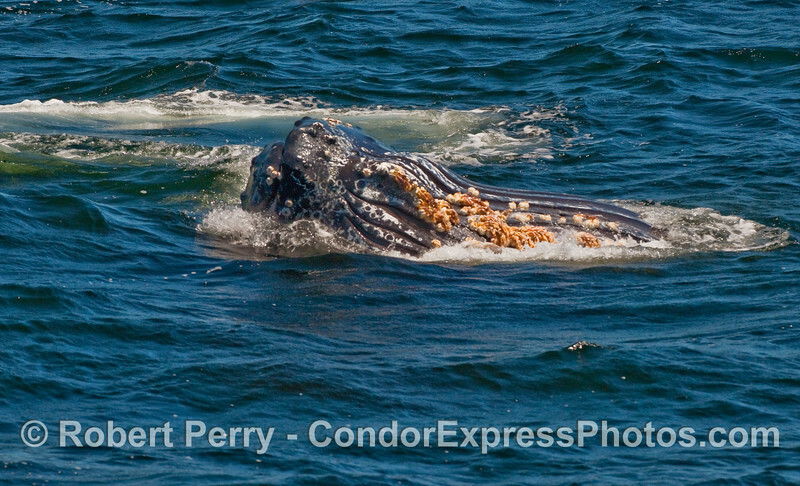 The birds are feeding on the same target prey as the whale: krill. 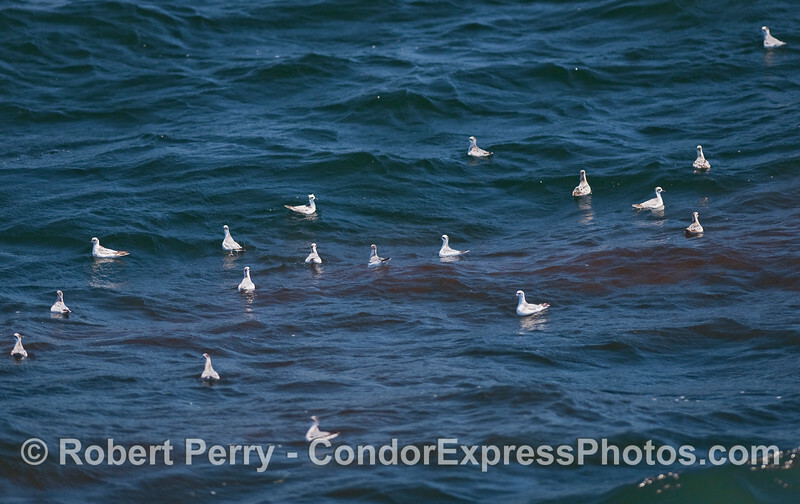 A red patch of krill (Thysanoessa spinifera) and tiny predators, Red-necked Phalaropes (Phalaropus lobatus). 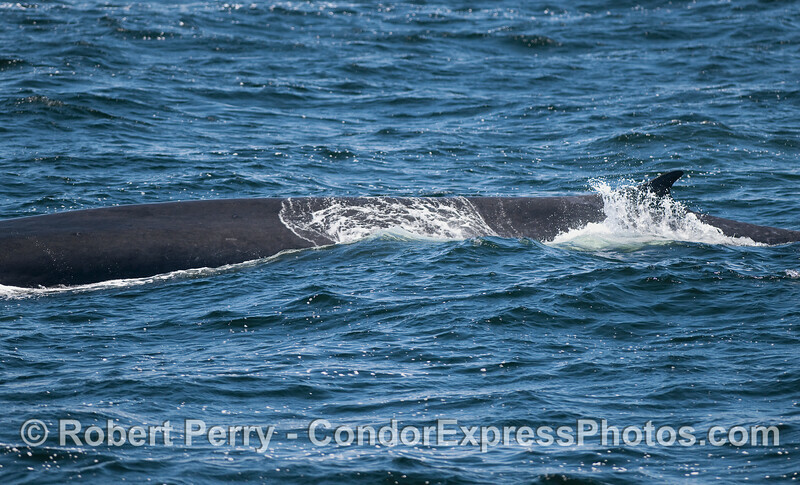 The whole body, looking from tail towards the head and blowhole, of a Blue Whale. 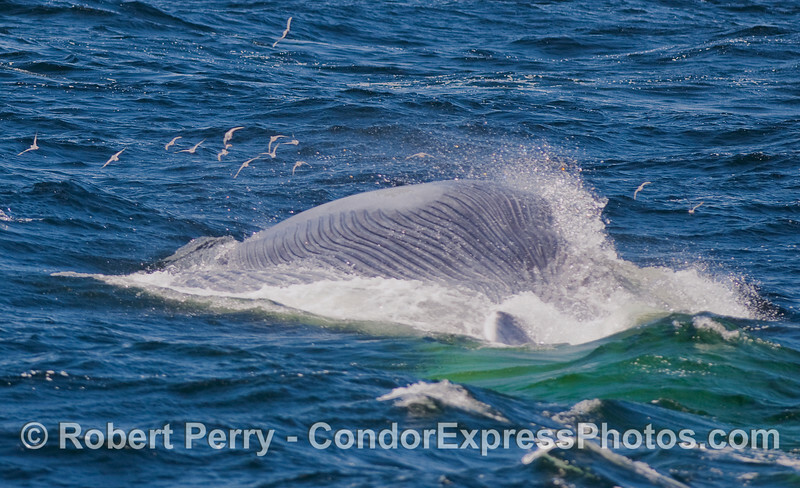 Stage one, a Humpback Whale expels air and heads for the nearest krill patch (to the right). 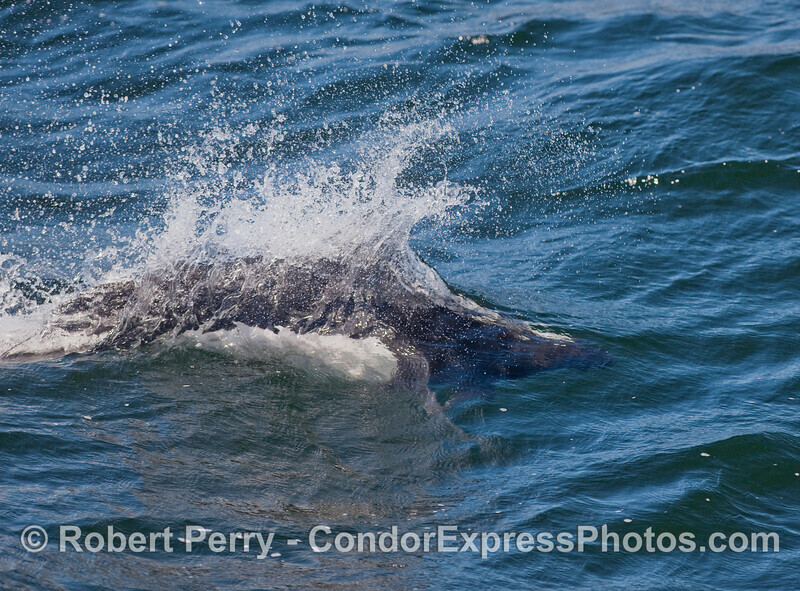 Image 1 of 2: Humpback Whale feeding on the surface. 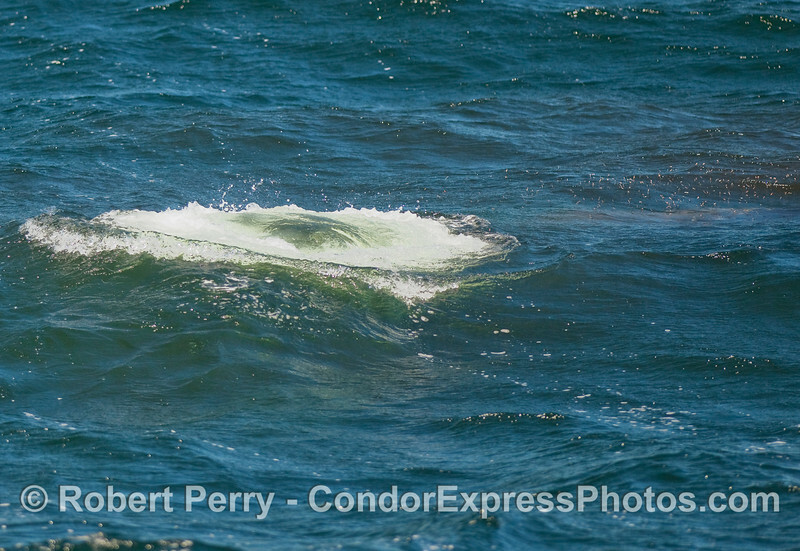 Image 2 of 2: Humpback Whale feeding on the surface. 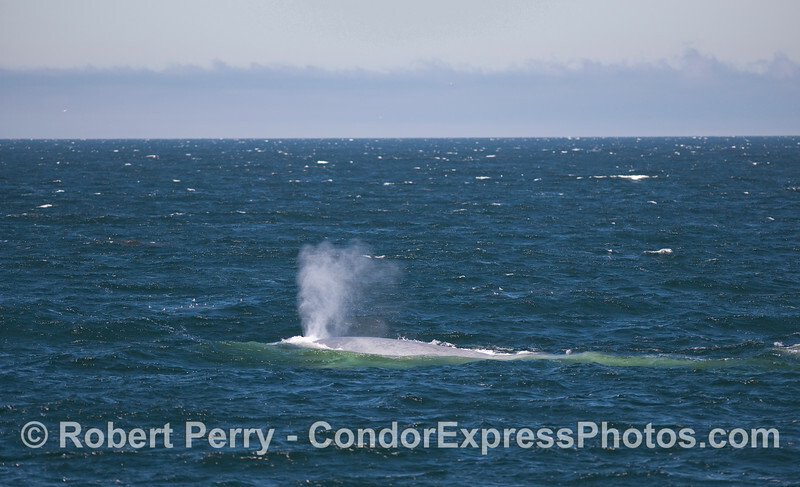 A giant Blue Whale spouting on a windy sea. 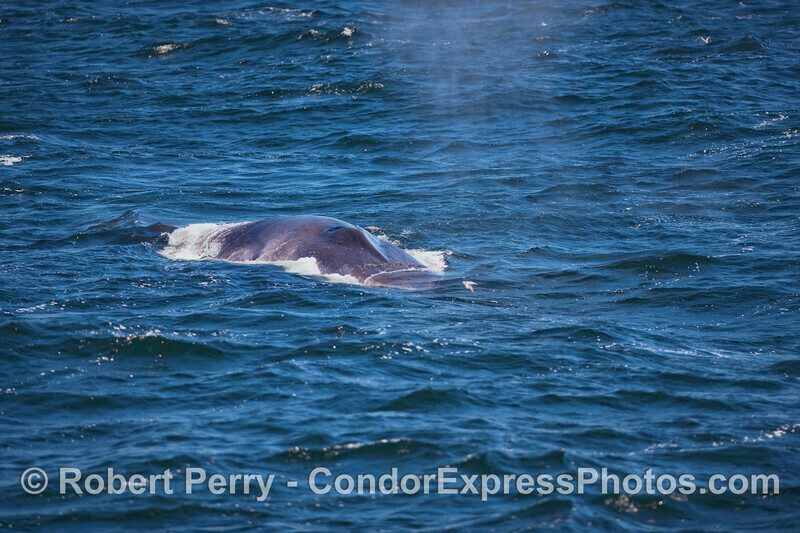 Close up look at a Blue Whale's head, left side. 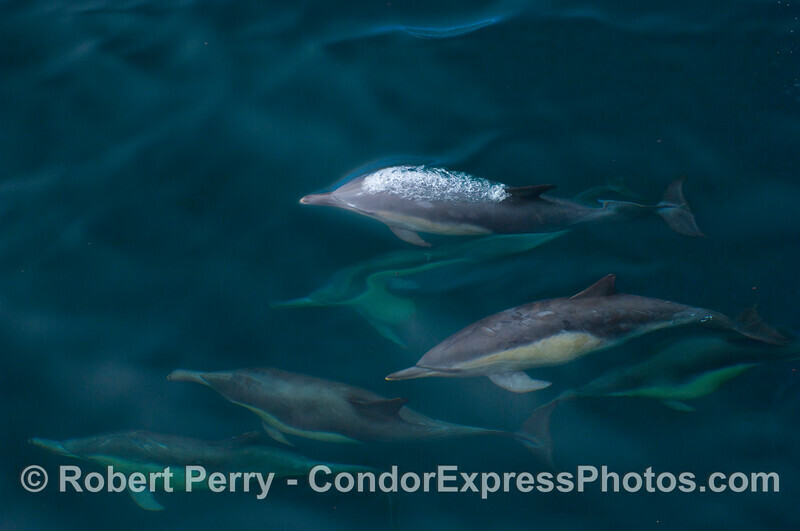 Lots of underwater Common Dolphins. 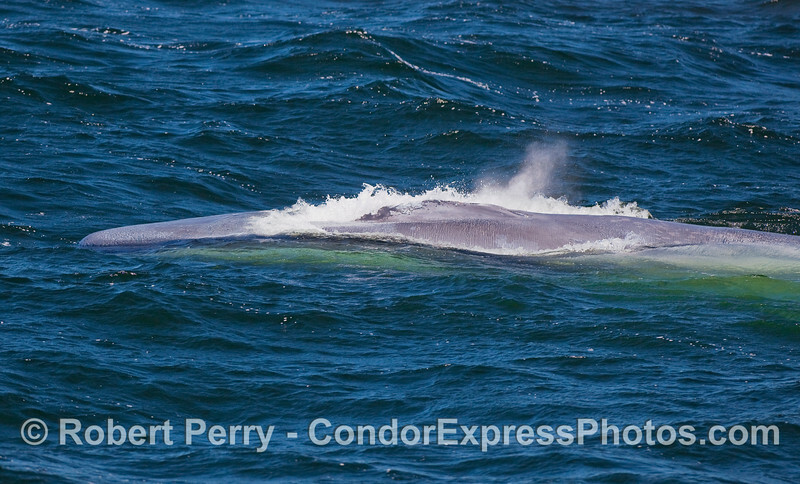 Here's a Blue Whale coming directly at the camera. 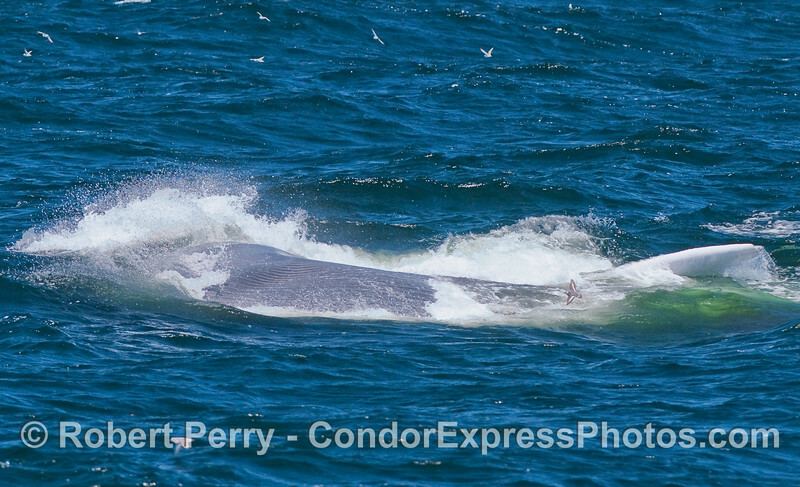 A massive surface lunge by a Blue Whale...again the Phalaropes are sent flying. 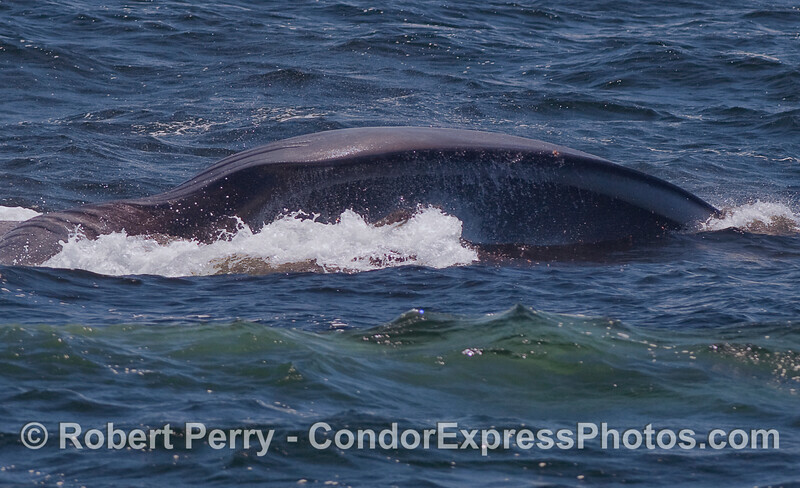 Another surface lunge by a hungry Blue Whale. 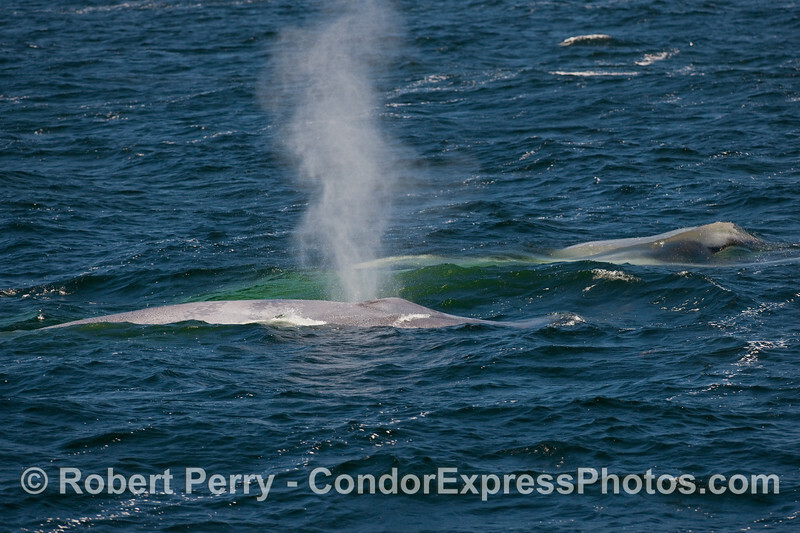 More Blue Whale surface feeding. 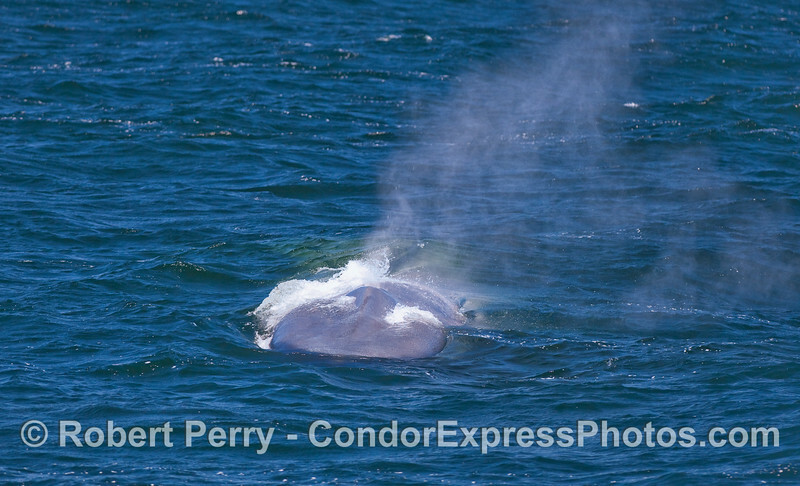 A surface lunge feeding Blue Whale, looking directly into the lower mouth area. 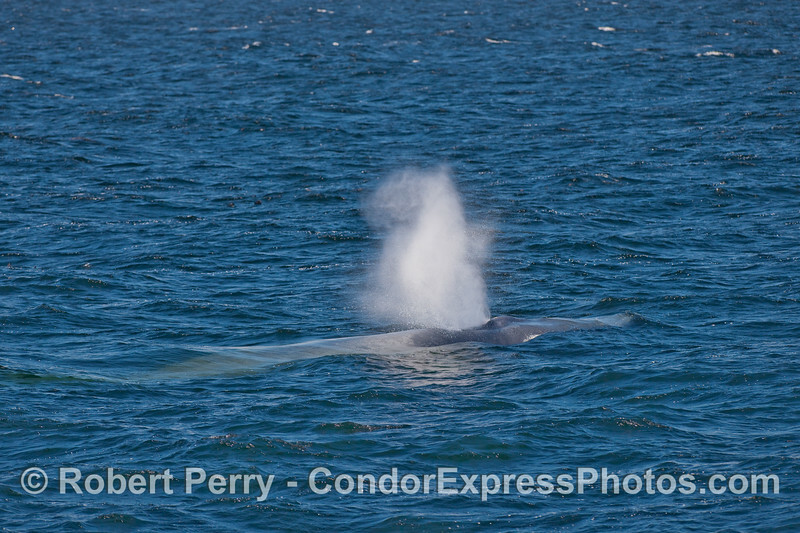 Nice look at a Blue Whale spouting. Double giants. 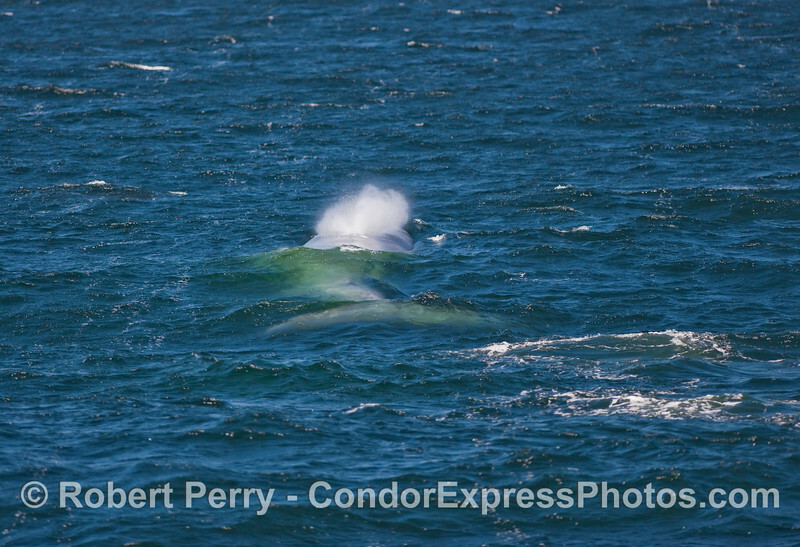 Blue Whales on a windy sea. 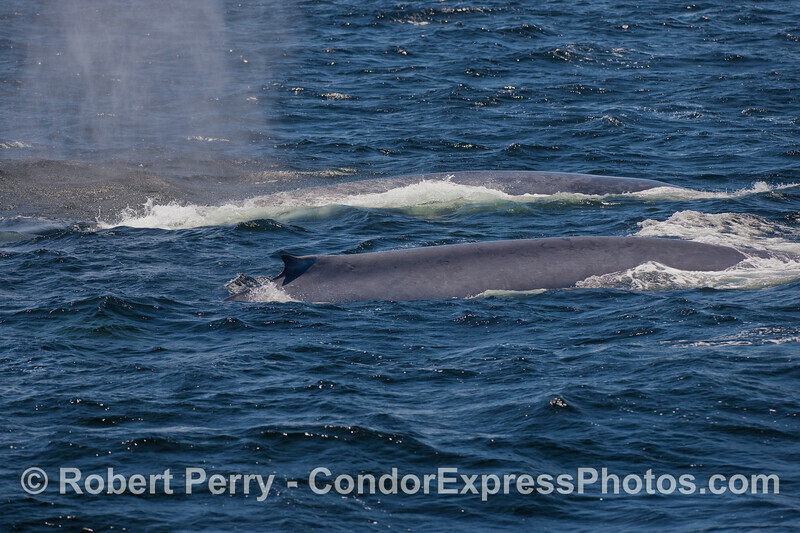 Twin giants, Blue Whales side-by-side. 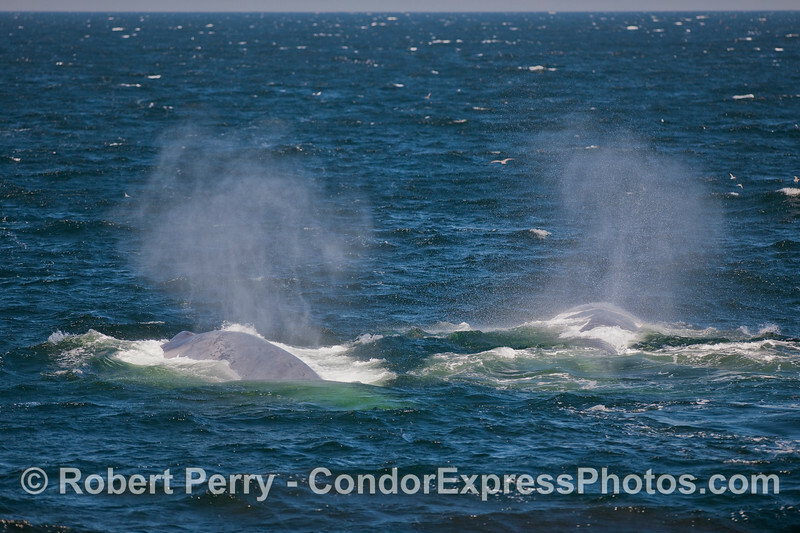 Dual spouts from two giant Blue's. 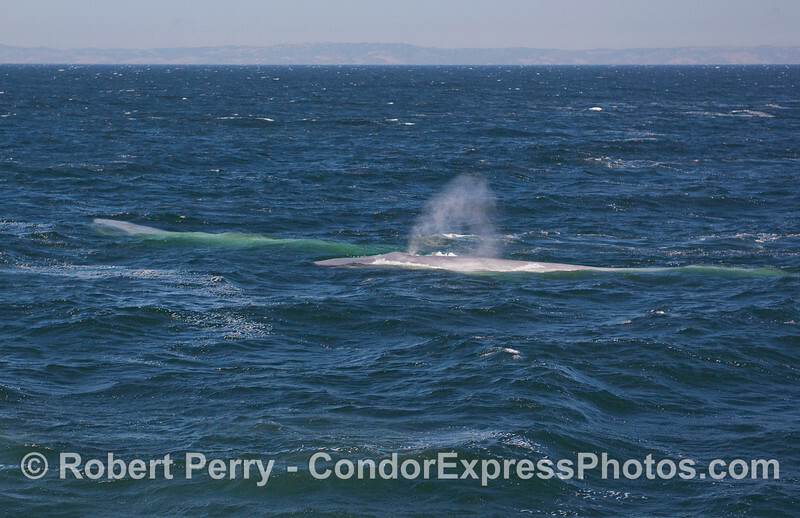 A Fin Whale heads toward the Condor Express. 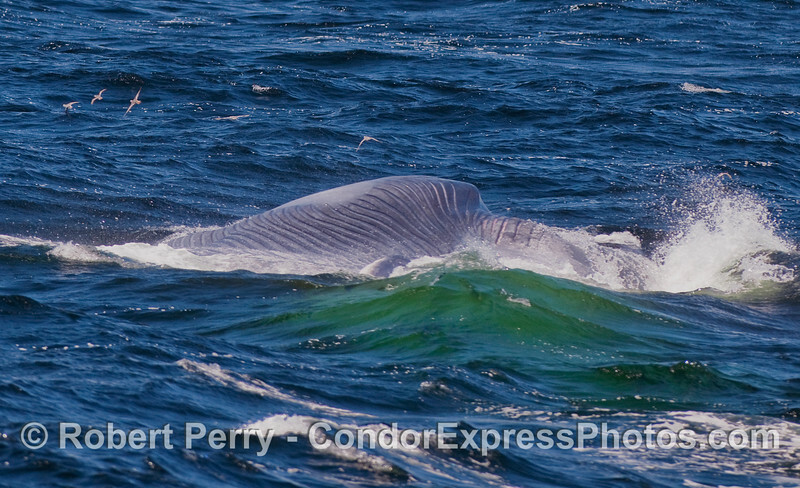 The "fin" of a Fin Whale. 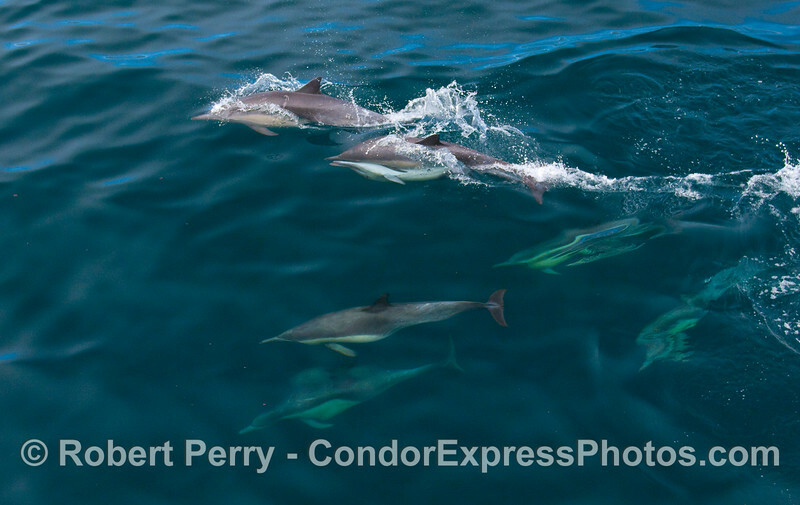 A whole batch of Common Dolphins. 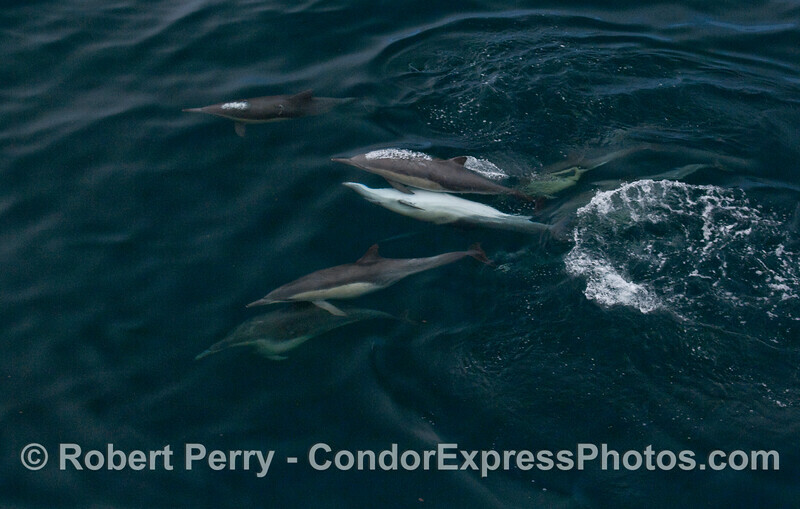 Close up look at a Common Dolphin feeding upside down on the surface. 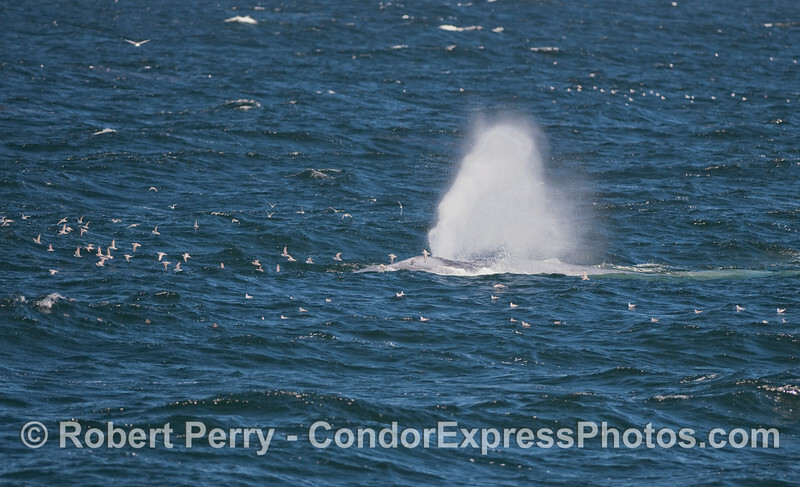 Two for one shot: A Blue Whale spouts on the left, as a Humpback Whale lunge-feeds on the right. 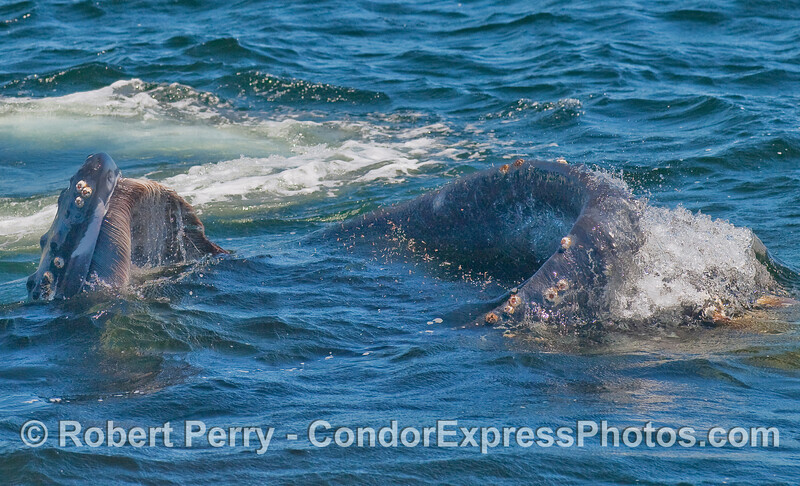 The expanded belly pleats of a lunge feeding Humpback. 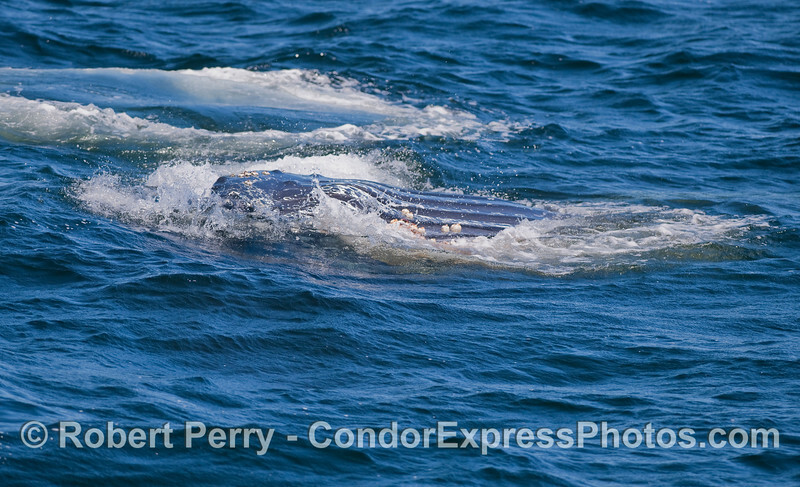 Ventral pleats of a hungry Humpback. 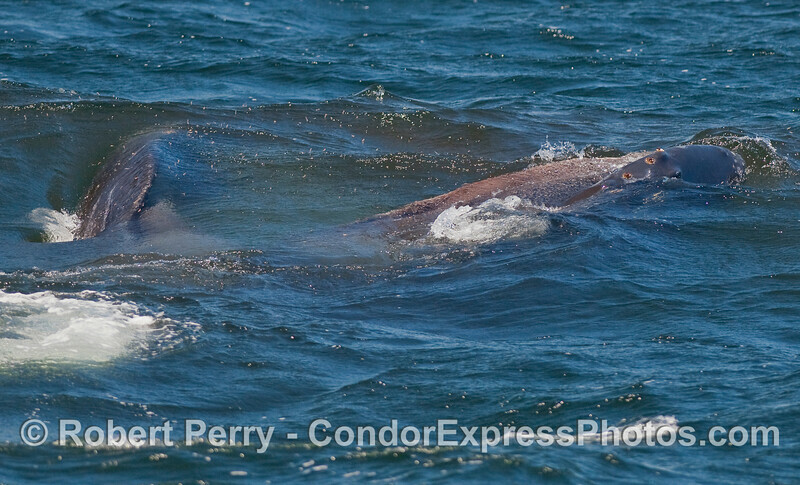 A Blue Whale and a Dall's Porpoise. 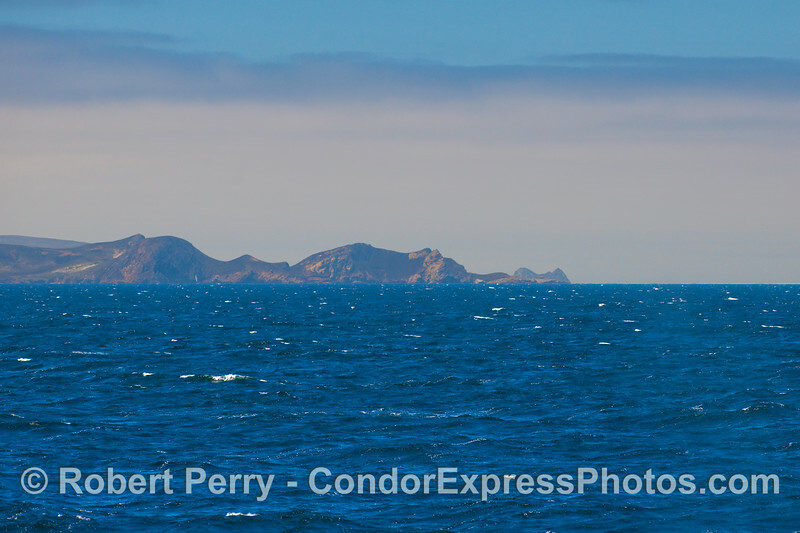 Harris Point and, in back, Castle Rock, San Miguel Island.